Victory Boogie Woogie was Mondrian's final work and he never finished it. Victory Boogie Woogie was Mondrian’s final work. If you look very closely you can see he never actually finished it. Instead of the usual painted squares, Victory is made out of tiny stickers and hand painted cellophane. Artist Charmion von Wiegand recalls visiting him in 1942, when Piet was super excited because he just dreamed about the perfect composition for Victory. He asked Charmion for advice and she helped him. January 1944, 2 years after the initial sketch, they decided the painting was fin-a-lly finished. By then Piet was already very sick, probably suffering from pneumonia. A week later she found him unable to get out of bed and their mutual friend Harry Holzman called a doctor. That same day Piet was taken to the hospital. Later Charmion noticed Piet had changed the painting drastically. Sick as a dog, he scraped paint from the canvas, moved pieces of tape around and even readjusted the canvas to it’s frame. After Piet died, Harry Holzman inherited all of his paintings, except Victory Boogie Woogie. This painting went to Valentine Dudensing who kept it in his gallery and refused to sell it, until someone would offer him enough money to buy "a small castle in France." Emily Tremaine offered $8000, which isn’t a lot of money for a castle, but for a Mondrian it was an outrageous amount! After the Tremaines passed away in 1988, Victory was bought by Samuel Irving Newhouse and his wife Victoria for $11 million. The Newhouses were obviously super wealthy so Victory was hanging in their apartment facing the NYC skyline. After a while they realized they didn’t want to hold on to Victory forever, but then again lending it to a museum would most likely damage the painting. The only option left was selling it...for a ton of money, duh. The Gemeente Museum in the Hague really really really wanted to get their hands on Victory, figuratively of course, so they desperately tried to rack up the $14 million S.I. Newhouse was asking for it. Unfortunately they failed and were only able to get to $12 million. Newhouse knew the Dutchies would do anything for this painting, so a few months later Newhouse cranked up the price to $16 million… you can see where this is going right? The museum tried again and this time they made it to $16 million! Hurrah! But…Newhouse was like “too late, It’s $20 million now!” The Dutch didn’t budge, but in 1996 Newhouse tried to sell it to them again. This time he asked for a whopping $30 million. Apart from the fact that doubling the price is a douchey move to begin with, obviously the museum couldn’t come up with $30 million that fast. Jan Boll, chairman of the Rembrandt Association (the largest group of art patrons focusing on art and art acquisitions in the Netherlands) became obsessed with getting the painting to the Netherlands. He knew the association would never cooperate, so he started his own fund to collect the millions Newhouse was asking. Which, by the way ,was $40 million at this point. Without a dime in his fund, Boll advised the Gemeente Museum to take an option on the painting anyway. Meanwhile he visited Nout Wellink, president of the Dutch National Bank. Wellink told him they were planning to set up a fund anyway, to celebrate the introduction of the Euro. They wanted to give the Dutch art in exchange for losing their beloved Guilder. Perfect! Sounds like almost everyone was on board, the only guy left to convict was Gerrit Zalm, the minister of finance. As sole shareholder of the Dutch Bank, Zalm’s approval was necessary. He approved, but without telling anyone in the parliament because Boll convinced Zalm that was the only way. The Dutch citizens were outraged with the whole ordeal, mostly because these elitist pricks bought this “freaking hideous” painting with THEIR money. The art world totally ROFL’d because the Dutch never even negotiated the price! 40 million was wayyyy too much for a Mondrian. Well, at least the Jan Boll and the Gemeente Museum were happy! Even if their faces were red. 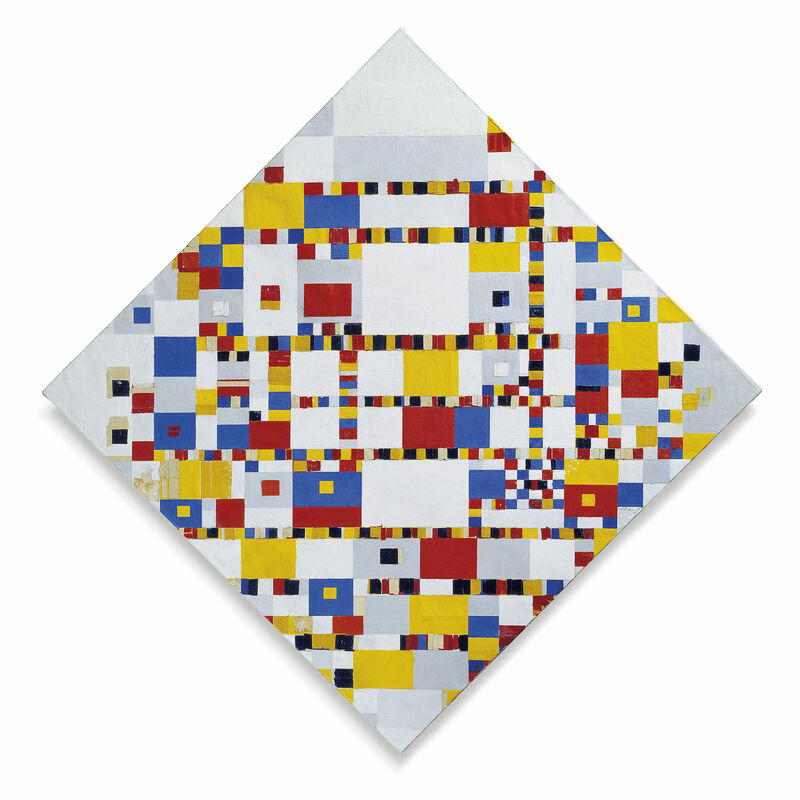 Victory Boogie Woogie is the last, unfinished, work by the Dutch abstract painter Piet Mondrian. Left incomplete in 1944, since 1998 it has been in the collection of the Gemeentemuseum in The Hague. It was purchased at a cost of 80 million Dutch guilders (approximately 35 million euros) from the American collector Samuel Irving Newhouse, who purchased the work from Emily and Burton Tremaine for $12 million USD in the mid 1980s. It was bought by the Stichting Nationaal Fonds Kunstbezit (National Art Foundation) through a gift from the Dutch Central Bank, commemorating the introduction of the euro. This amount of money spent on the gift raised questions in the Dutch House of Representatives. The artwork was purchased by the Tremaines shortly after Mondrian's death and became part of the Miller Company Collection of Abstract Art in Meriden, Connecticut. In 1947-52, Victory Boogie Woogie was exhibited as the lead artwork in the corporate collection's exhibition Painting toward architecture, originating at the Wadsworth Atheneum in Hartford, CT and travelling to 28 venues across the United States, including the Walker Art Center in Minneapolis, the Baltimore Museum of Art, and the Los Angeles County Museum of Art. With the artworks fragility, a copy of the artwork, and an interpretation of the artwork "completed", was exhibited in most venues. The exhibition catalogue essay was by Henry-Russell Hitchcock with foreword by Alfred Barr at the Museum of Modern Art, New York. A photo of the painting in on the cover of the biography of art collector Emily Hall Tremaine as well as the exhibition catalogue The Tremaine Collection: 20th century masters]. In 2014, U.S. President Barack Obama was photographed with Victory Boogie Woogie, sometimes with Dutch politicians, which was widely reported in Dutch and Flemish (Belgian) news media. In addition, photographer Louise Lawler has appropriated partially cropped views of Victory Boogie Woogie in several photographs focused on the Tremaine art collection in residential interiors and on view in the 1984 Tremaine Collection exhibition at the Wadsworth Atheneum, Hartford. Check out the full Wikipedia article about Victory Boogie Woogie.